This handheld grooming comb will be a fantastic addition to your pet maintenance kit. It is essential to remove lose hair and prevent the hair from being located around your house instead of in the bin. 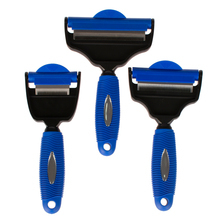 The rubber lined plastic handle gives great grip and the stainless steel teeth will do an impressive hair removal job. Size : There may be 1 ~ 3cm error because of manual measurement. A great thing! Comb better than just brush! Like a cat! Tyazhelenkaya, size M. Rubber handle, protective cap to the blade! The Seller sent immediately, it quickly! All class! Will comb out the cat! Meow! excellent, took мурки дворянской for average size. вычесывает good. пользуюсь зубчиками small. order received. thank you so much. very satisfied!!!!! Пришло очень быстро. Качеством доволен. Рекомендую. быстрая доставка, качество на высоте! в магазинах за такие деньги лишь Г продают а тут качество брендовой товара! всем рекомендую.